Every week, I scour the web to find inspiring outfits on your favorite celebs and help you recreate their looks! This week, I was inspired by Lucy Hale, Dakota Johnson, and Chloe Grace Moretz, who all wore low-top sneakers. Read on to see how you can get their looks for yourself. Lucy Hale was spotted on a Starbucks run wearing a laid-back yet super trendy look. Lucy layered an oversized denim shirt over a ribbed white top and some yellow high waisted shorts with tortoise buttons down the front. In addition to her trendy shorts, Lucy also carried a black straw circle bag, one of the major fashion statements of the season. Her white low-top sneakers kept her ensemble casual and comfy. Anything with buttons – preferably oversized, tortoise ones – will have you looking right on trend this season. 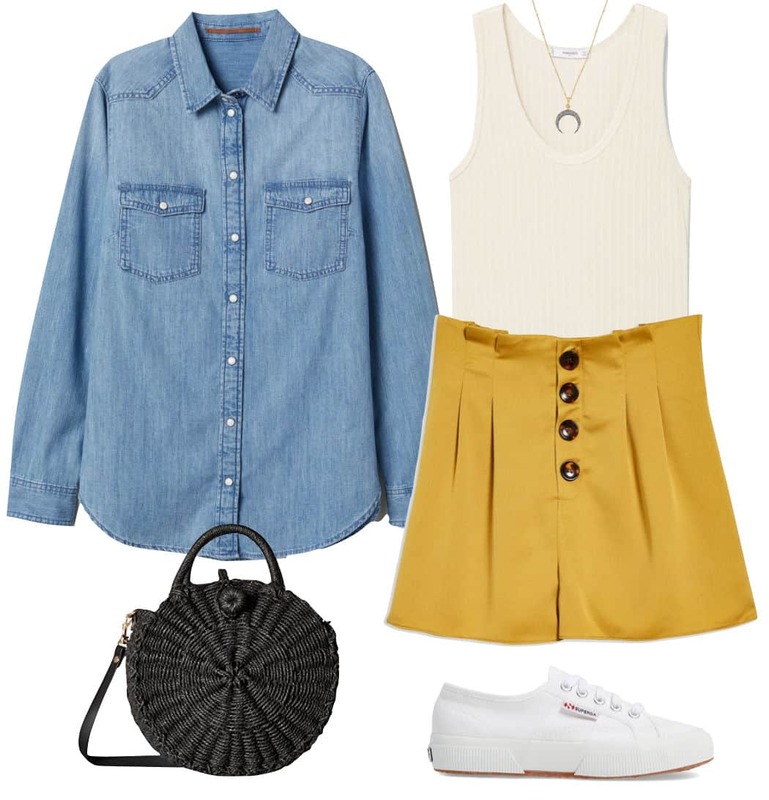 These yellow high waisted button-front shorts are the perfect dupe for Lucy’s pair, and can be worn casually during the day, or dressed up at night. For Lucy’s look, wear them with a ribbed white tank and a denim shirt layered over top. Opt for trendy accessories like a black round straw bag and a horn pendant necklace similar to Lucy’s. 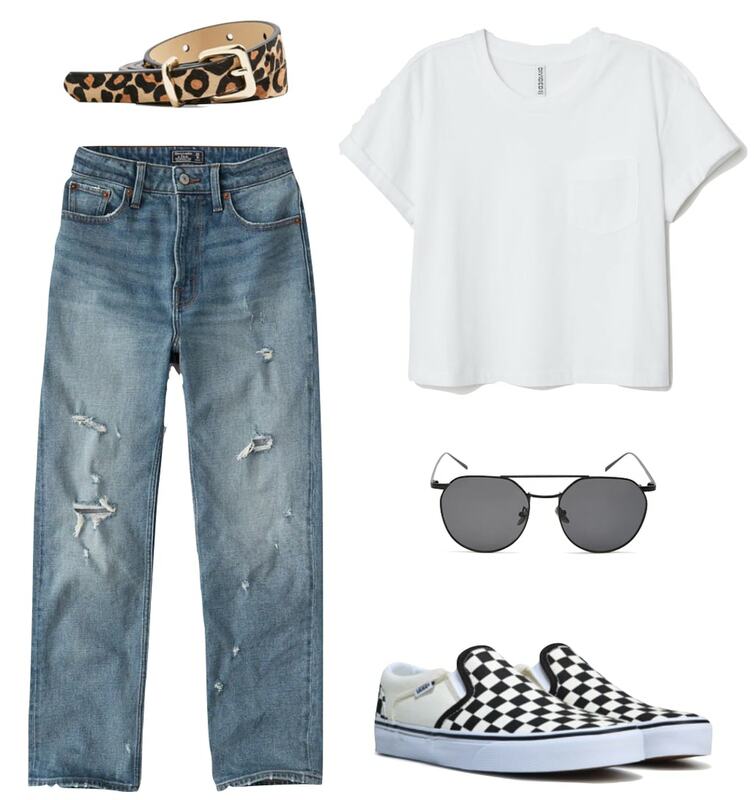 White low-top sneakers complete this casual outfit. Actress Dakota Johnson looked feminine yet laid-back in a dark floral wrap dress paired with low-top side stripe sneakers. Dakota’s ensemble proves that sneakers go with just about everything, including girly, dressier looks. Dakota’s look effortlessly combines the feminine feel of a floral dress with the laid-back comfort that sneakers provide. This dark floral print wrap dress is a summertime must-have, and looks just as good with low-top sneakers as it does with heeled sandals. These feature a side stripe design to give you a similar look to her Gucci pair. Pull the ensemble together with some oversized navy sunglasses and a burgundy clutch bag. Chloe Grace Moretz hit the supermarket this past week in a sleek summertime look that had a casual twist, thanks to her kicks. Chloe wore a dark denim button-front mini skirt with a white short sleeved button-front collared shirt and white sneakers. She accessorized with silver drop earrings and a red lip. While I don’t dress like this to go grocery shopping like Chloe, I do love her clean, chic look for a day spent exploring the city or brunching with friends. To get her look, pair a dark denim button-front skirt with a white button-front short sleeve shirt (tucked in). White low-top sneakers make the ensemble functional and more laid-back. Keep accessories minimal with some silver drop earrings and a pair of sleek, dark sunnies.